It was just a matter of time until my furbaby was introduced in this blog. 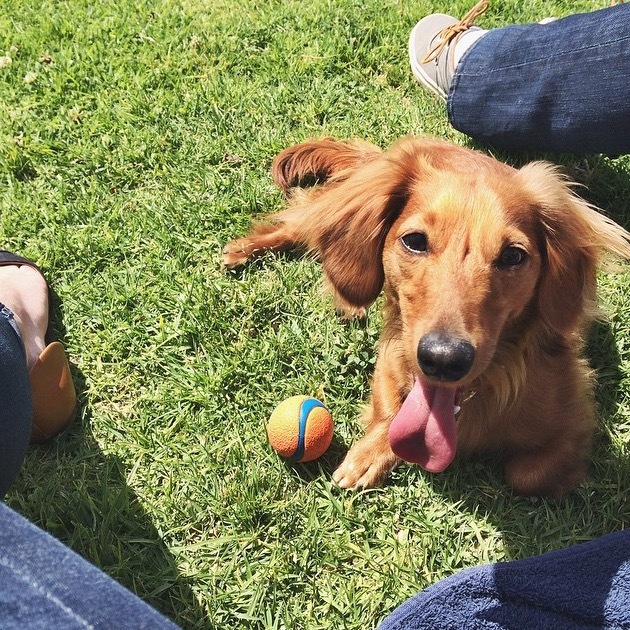 Everyone, meet Jack Kerouac the adorable long-haired dachshund! Gawsh, his face gets me every time. Growing up, I was always a cat lover and didn’t pay much attention to dogs. In my twenties, some major cosmic shift must have happened or something because now I cannot get enough of them. I react to cute dogs in public the way that some people do with babies. Gimme a cute dog over a kid any day! I love all kinds of dogs. Huge, teeny, fast, clumsy – each breed has something unique to offer. 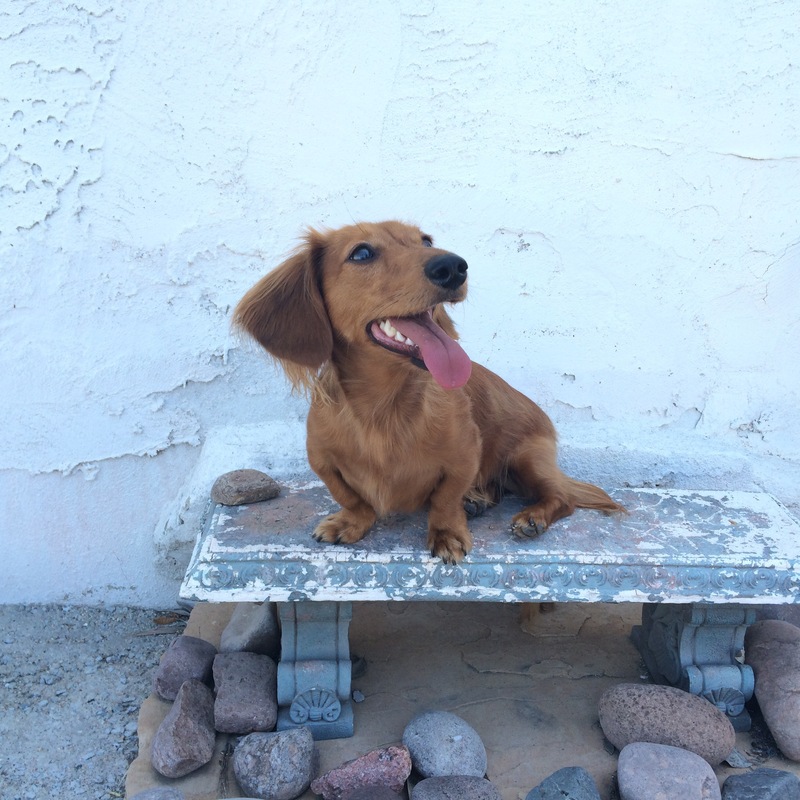 I had never even seen a long-haired dachshund until a few years ago. Once I did though, that was it for me. I knew I’d have one someday, and now here we are! I took Jack home when he was 9 weeks old, and he’s nearing 2 now! I never fully understood unconditional love until I owned a dog, but it’s such a beautiful thing to experience. I’d take a bullet for my pup and I know he’d do the same for me. I just adore him with everything that I have. San Diego is a great city for dogs! Many dining establishments accommodate them, and some even have dog menus. Last weekend I met up with some friends for margaritas in Old Town at Fred’s Mexican Cafe. They bring your pup water right away, and have a full dog menu with 5 or 6 options. I ordered Jack a hamburger patty and it was such a treat for him, he scarfed down the whole thing and sat quiet and happy while we chatted and sipped our drinks. I know most dog owners only take their larger pups to dog washes, but I prefer it for Jack too because it’s way more convenient, and he definitely gets cleaner there than when I wash him at home. Plus, you don’t have to clean up! Win-win. My absolute favorite dog wash in San Diego is South Bark Dog Wash in South Park. The first reason I love it is because it’s in South Park which is my favorite neighborhood in San Diego! I would live there in a heartbeat if I could. I’ll definitely be posting more about my favorite places to go in that part of town later, but for now just take my word: South Park is awesome. The dog wash is located on a quiet street with lots of parking, so that’s never an issue. We like to go in the afternoons on the weekends. The longest we’ve ever had to wait was 15 minutes, very quick and efficient for only having 6 tubs! South Bark is a do-it-yourself dog wash, but I prefer that. 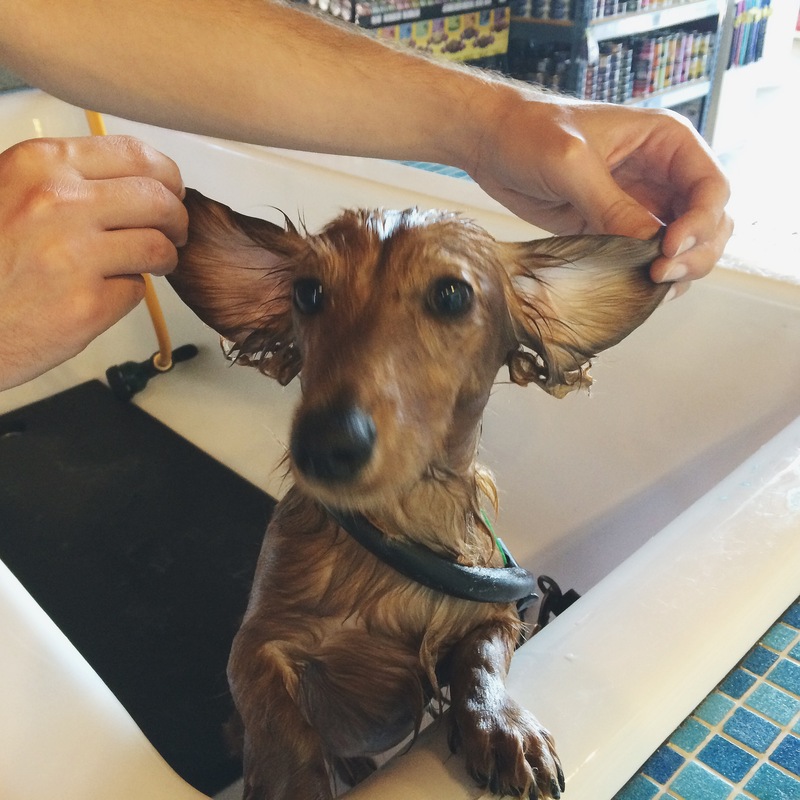 The staff is always friendly and attentive, and will come clean out your dog’s ears for you if you ask. Also, if it’s your first time there they will happily explain how everything works, in which order to use the soaps/conditioners, show you where to find brushes, etc. I always feel right at home when I visit. My recommendation for a wash package is the Blueberry Love. South Bark is famous for their blueberry facial, which they’ll come and apply for you on your pup’s face and head, giving them a little massage in the process. I love watching Jack’s face when they do it, he looks like he’s going to fall asleep from being so relaxed. The Blueberry Love package is $17.50 and comes with hypo shampoo, a blueberry scented brightener, blueberry clove conditioner, and blueberry clove spritz cologne for the end. I feel the price is fully worth it because Jack stays clean and smells like a blueberry muffin for a full month afterward. They also have a patio where you can brush your dog before or after the bath, and also use the driers if you wish. When Jack is all nice and clean, we usually saunter down the street to Stone Brewery’s South Park Tasting Room, but I’ll save the particulars of that for another post. Have any of you ever gone to South Bark? What’s a great dog wash in your area?